YES!!! This course has been life-changing. I know folks say that about a PDC, and now I know why, having been through one - even a virtual one. 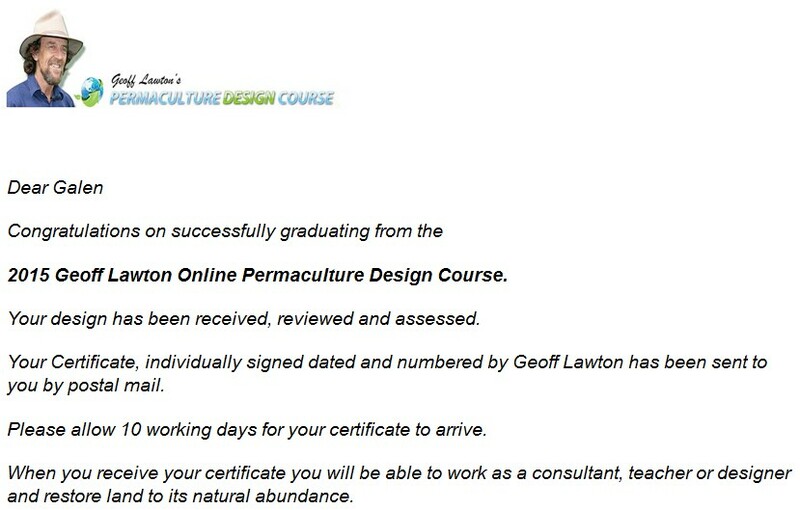 I really do believe that what I have learned in this course will enable me to "restore land to its natural abundance". I feel confident that I could do this on a small scale, and would be up for the challenge of designing for a larger area. Of course, nothing can substitute for practical experience. Apart from applying at our home what I have learned in this course, I hope the folks for whom I designed their property as my design exercise will implement all or part of the design, and that I can help them in that process in order to gain more on-the-ground understanding. Next I'd like to design more properties for folks in my congregation, and for other congregations' properties. If you currently water and mow your church lawn, why not transform it into a more sustainable, productive landscape that provides food for a local feeding ministry? Why not create space for animals and increase biodiversity? How about moderating heat and cooling bills through thoughtful design and planting? I'll design it for free, just for the experience and to help in the restoration of the planet, one congregation at a time. In the mean time, I will periodically review the lessons of the course over the next year (all the material will be available for that time) and continue to learn what I can. I will also continue to discern the connections between the systems thinking espoused in the PDC, and congregation systems. They are there, I can feel it, and have already begun to tease them out. Thanks for reading this blog. Now get out there and grow something. Have you heard this one before? NEVER, bury the crown of the strawberry. Really? What's this then? Healthy strawberry plants emerging from their winter slumber beneath a 4 inch layer of mulch, that's what. Spot the 'sparagus. Hint - it's purple. I love how the water drops get caught in this succulent. Somehow, the surface tension keeps them round-ish. Grape Hyacinth near the garden gate. Ready beds and barrels, though the mulch hasn't been down that long so we'll probably need to fertigate with worm juice this year. Maybe this Fall I'll get my act together and mulch sooner. Peering down into a crocus. Crocus and a heavily pruned Helebore. Looks like it is time to divide those grasses. 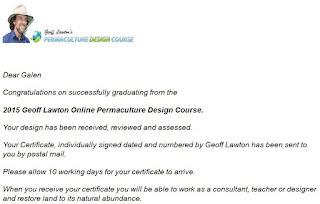 So I have finally done it - I am officially enrolled in Geoff Lawton's Permaculture Design Certificate Course. YES!! I am too excited to adequately convey in words how I feel about this. If you have never heard of permaculture, please check out any of Geoff's videos. 'Greening the Desert' is a good place to start if you want to see something amazing. Look for it on Youtube. But I don't live in a desert, you may say. Neither do I! Permaculture is an ethical design science for building sustainable habitat that cares for the earth, cares for people, and returns the surplus in ANY climate where people live. That includes the wet and cold Pacific Northwest. I spent yesterday afternoon enjoying a break in the rain, planting in our front bed. Kristi and I went to Watson's nursery on the way home from a nice day out (lunch at Friesenburger, shopping at the used book store) and bought Asparagus crowns. Out front behind the apple trees are now two Jersey Knights and two Mary Washingtons. Hopefully this year they'll grow tall and sink deep so that next year we can harvest. I know, you're supposed to wait a couple years. I have a feeling these plants are going to love the front bed and get settled in just fine. We'll see next year how they look...and maybe how they taste. Finally, I want to say that I'll be updating this blog more regularly, but I won't say how often. I've been better at maintaining the train blog, my hobby, my sanity-soother from stress. But there are many outdoor projects going on and plenty to share here as well. So look for updates to come this Spring. Here are a couple pictures from last Spring, 2014 - the first is from April 8, the second May 27. What a difference a month makes! I had an idea to write a review of the film "Back to Eden" on my blog, even before the official release. But that's way too much work and I don't feel up to a full-blown discourse right now. Besides, I'm not a film critic. I doubt the film will win any awards on the technical side of things - it's well done, but the cinematography didn't blow me away. Where this film really shines is the content. What Paul, et al, are doing is simply amazing. As a minister of the gospel of Jesus Christ I am very pleased to see such an integration of faith and practice at work. As a gardener I am further encouraged to listen to God and watch for his hand at work in my garden, teaching me his ways. As a member of the human family, this film makes me hopeful. We can do better and this is one way forward that makes too much sense. Go watch it. The full film is available free. Be blessed! No, that's not a new race of beings for a fantasy action adventure game. It's a plant name and a concept in a combination perhaps never seen before. Deodar is the name of the beautiful cedar trees along our fence. There are four Cedrus Deodara 'Aurea', or Golden Deodar Cedars planted just outside our backyard fence along the south side of our property. They are well established landscape trees with a drooping aspect and golden color. But what sort of benefits do they provide beyond beauty? What other functions do these trees have? This is a very 'permaculture' question - are there stacked functions at work in these trees? That's where the Guild concept comes to play. I recently finished 'Gaia's Garden' by Toby Hemenway. I highly recommend this book for anyone seeking a better understanding of permaculture practices that can be adapted for home scale use. A plant guild is an intentional community of plants grouped in order to maximize benefit from shared proximity and stacked function. A good beginner example is the 'apple guild'. Google it if you want to know more about it. I'm talking about a Deodar guild here - something never seen before, as far as I can tell. Hemenway suggests a means of developing plant guilds by researching native plant communities. I discovered a plant survey from the Himalayan region of India where the Deodar Cedar is native. I found a short list of plants that nature has thoughtfully placed around Deodar cedars. Then I did a brief search on each - first to learn what the common names were, since the list was in Latin nomenclature, then to see if any could find a home in my yard surrounding my trees. This was an exciting process of discovery. 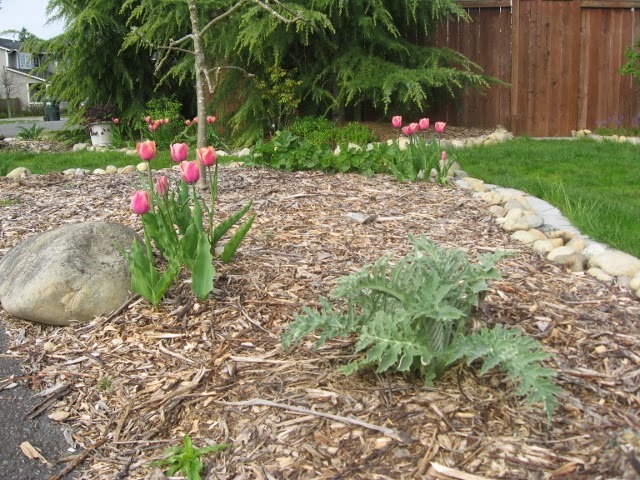 I found plants in the shrub, vine, herb and ground cover levels that could be easily adapted to my microclimate as guild plants surrounding Deodar cedars. Here's what I found: Viburnum, Artemisia, Lonicera and Indigofera. Let me parse that for you - Highbush Cranberries, Tarragon, Honeysuckle, and Indigo. Ah, that's better. The Viburnum could be the blooming variety, but why not pick one that fruits? Sheep berry or blackhaw would work too, but I know that Highbush Cranberries work in this region. The Artemisia is the Wormwood family (mugworts and sagebrushes too). 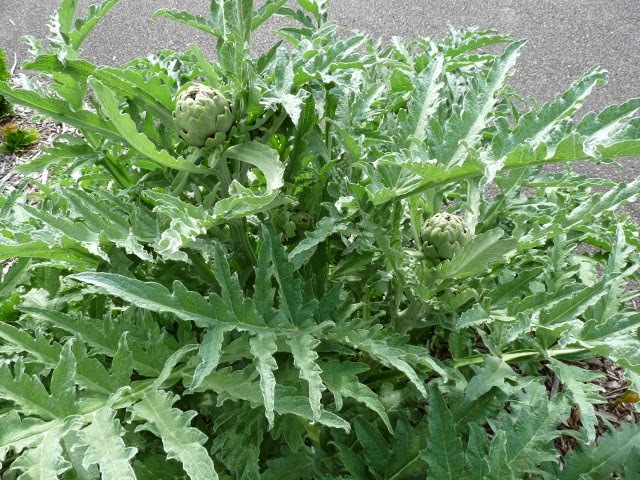 But again Tarragon provides an edible, medicinal herb as well as purported insect control to protect other plants. I could plant a vining Lonicera, or Honeysuckle, but here in the Pacific NW we can grow Blue Honeysuckle bushes, or Honey Berries. Just like blueberries they need two varieties to polinate. Hmm...Territorial seed company sells Honey berry bushes in just such a pairing. How 'bout that. Finally an Indigo, like the Hairy Indigo is a forage/compost crop that fixes Nitrogen. It will probably die back in the winter, but Indigofera Pseudotinctoria stays 2'-3' high and likes full sun. Throw in some clover for a spreading ground cover and I'm well on my way to a thriving Deodar Guild. Two berries - one red and one blue, plus an herb and a nitrogen fixer/compost crop, all of which should (theoretically) do very well in my location around my beautiful cedar trees...this oughta be fun! Now it may be a while before we can afford any new plants but I have a head start on the selection when the time comes. If any of you readers have any thoughts on plant guilds, let me know what you think of my combination. These approaches all have one thing (at least) in common - a covering of mulch. Almost all of these methods would be considered 'organic' in that there is no pesticide or herbicide use. But they are radical in that they go beyond organic into what is described as 'natural' or 'synergistic' by adding a no-till and no-fertilizer approach. There is no compaction of the soil, so it stays loose, rich and moist beneath a covering of hay, straw or mulch (or even wool!). I have become convinced that these are not just one-off experiments or exceptions to the rule that just happen to work because the gardeners are actually fertilizing or cheating in some way beyond the prescribed rules of the method. It makes beautiful sense when you stop to consider how nature functions, and, as Paul Gautschi says, how God designed the world to be. As a preacher I know how hard it can be to 'get out of the way' and let the Holy Spirit do its thing. But when I am successful in delivering a faithful message (not necessarily fancy or fitting but simply faithful to deliver the pure gospel truth) I can see the result in the many folks who say to me, "How did you know what to say? You were speaking to me today!" I tell them it wasn't me, but God found favor enough to use my foolish faithfulness and despite my sinful condition managed to connect with you through the Holy Spirit. I think it's the same way with the soil. We tinker with it by adding compost, fertilizer (even organic), etc. and then what? We have to keep tinkering in order to maintain the imbalance we created by overfeeding or undermining the natural processes already at work. So how do we get out of the way and let nature do what it's already wanting to do? And how does it work? The what to do is well covered by the folks already linked above. The how is another story altogether. That's covered in great but easily digested detail in this book, "Teaming with Microbes" by Jeff Lowenfels and Wayne Lewis. I checked out a copy from my local library and devoured it in a few evenings. The soil food web is the amazing universe of life beneath our feet. 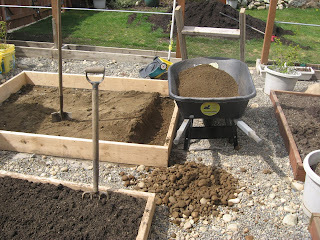 Or, rather, to follow Hazelip's advice - no compacting the soil - in our garden beds. I learned that plants actually communicate with the soil life by exuding and secreting substances (exudates) from their roots that attract microbes which will turn organic matter and other soil critters into nutrients the plant can use, in a form the plant can uptake. This is cutting edge science that stands poised to reverse the green revolution; it's that radical. This is the why behind the mulching methods and, not to put it too lightly, every functioning soil system on the planet. Suffice it to say my approach to gardening has shifted dramatically since awakening to the soil food web. My job is no longer to feed the plants, but to feed the soil. Soil remediation and repair is possible with a few simple steps like sheet composting to get the process started, then patience and time as nature does the rest. In fact, the soil can be repaired very quickly in the span of a few seasons of intentional 'work', allowing a cover crop to do it's thing unseen beneath the surface. In nature this process of gradual rebuilding and succession takes several years. We can duplicate this process and shorten the timescale by bringing together the elements needed then getting out of the way. Okay...enough for now. Can you tell I'm excited about this? I hope you'll take the time to follow these links and do some research on your own. When I set out to prepare the raised beds this spring I discovered just 'how firm a foundation' we really have around here. Too firm, in the sense of having too many rocks, but also not firm enough. Take away the rocks and you're left with mostly sand, some silt, and very little organic matter. I submit these two pictures to illustrate my previous plight and some solutions I've developed in response. In the image above you can see the tools and maybe get an idea of the method I use for sifting out rocks. Leaning against the wheelbarrow is a home-built screen of 1/2" hardware cloth fastened to a 2x4 frame. When I was making this screen a few years ago, I was surprised to learn that hardware cloth isn't really fabric, but screen. Well, why don't we call it metal screen? 'Hardware cloth' seems to be one of those terms developed to create a crowd of those in the know and those who've yet to learn. Like dimensional lumber. Whose idea was it to make a 2x4 smaller than 2 inches by 4 inches? Just another method of exclusion and tradecraft skill/knowledge protection, if you ask me. So I lay the screen on the wheelbarrow, then shovel on some dirt. After shaking vigorously (sliding the screen back and forth) I dump the remaining rocks behind the wheelbarrow over the handles. The sand/silt and pea gravel that remains gets mixed with compost about 50/50 and dumped back into the bed or simply dumped into the bed then later amended with compost. Hard to believe this picture was taken on April 10 of this year (2010). In this picture above you can see the 'threshold' I made using a few fine specimens of stone I found during the raised bed excavations. This was a fun little project I decided to do one afternoon when the berry beds had been completed. 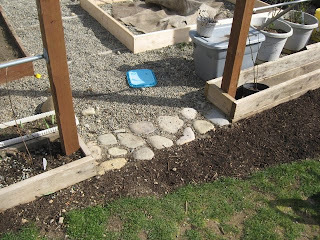 The compost you see between the beds and the grass is area that used to be weed cloth and pea gravel just like the paths around the raised beds. In fact, if you look into the raised bed just beyond the threshold you can see some weed fabric (it really is fabric, not metal screen) laying in the bed frame. This image was captured on March 20, 2010. The composted area has since been seeded and has grown in nicely. I need to add more fine compost to raise up the ground level to match the existing ground. The new ground settled more than I thought it would. In an upcoming post I'll share what I've been reading about (hint: the soil food web) and how hay mulch fits into that picture.